One of the most Sisyphean roles of parenting a kid with disabilities is helping people see their abilities. If your child has challenges with speech or physical disability, as Max and other kids with cerebral palsy do, it can be even more of an uphill battle as others may take their differences to mean they lack smarts and comprehension. 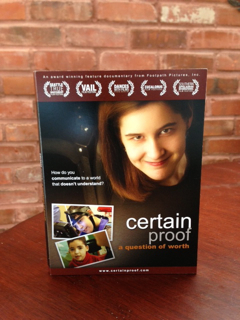 That's a running theme of Certain Proof: A Question of Worth, a powerful documentary directed by Ray Ellis and produced by Susan Ellis, his wife. The couple followed three mothers and their children with severe cerebral palsy for two and a half years, detailing their experiences in public school as they "proved" they were capable of learning, just like any other kid. The results are eye-opening, thought-provoking, moving and deeply disturbing. As you watch Josh, 6; Colin, 10; and Kayla, 12 in their classrooms, the challenges they face quickly become clear. "It's hard when people around us don't think he's in there," says Dawn Werner, Josh's mom. "The world assumes he can't learn, that's the danger. Why not assume he can understand everything?" The mothers are relatable on so many levels. You ache for them because you are them, that mom so hungry to enable her child and help him achieve his best. It's distressing, too, to watch teachers and therapists trying but failing to engage the kids. ("Whenever I start at a new school, they look like a bomb hit them," notes Kayla.) You come to realize that the children are bored. They are not being mentally stimulated. They are frustrated. Certain Proof raises major questions about the education of children with special needs, and makes the case for inclusionary classrooms for the sake of the kids and society, too. "Moving as many kids into regular education benefits the total population so much better," says Kayla's mom. "We have to find a way to promote them and make them as self-sufficient as possible." Notes Karen Erickson, an expert who studies children with disabilities, literacy and communication at University North Carolina, "If these children with severe disabilities are educated in a completely separate environment, they will never have opportunities in the community when they leave and they will have to have systems of separate service delivery for the rest of their lives." Max's IEP is coming up next month. First, though, I am going to be sharing my copy of the DVD with our district coordinator, and again broaching the topic of placing Max in an inclusionary setting. But there are variables to consider with these decisions, which the film doesn't get into. For us, they include the quality of therapists and aides in our local schools (a couple of years ago, they fired the longtime aides and hired hourly-rate staffers of dubious quality). Also: We adore Max's school, and he's doing really well there. Ray Ellis was gracious enough to offer four copies of the documentary to give away. If you'd like to enter to win one, you can privately submit your name and email via the form below. I will randomly choose four winners by 3/8 at midnight, announce them here and alert you by email. The DVD can be also purchased here for $19.95, plus shipping and handling. I asked Ellis how making the film changed his perceptions of kids with disabilities. "I did not understand how trapped they were in their bodies," he says, "and that they are being held to a different set of standards and being asked to prove themselves over and over again. We almost named the film 'The Least Dangerous Assumption'—assume all children understand you and can learn. That is the only way not to limit their potential." The DVD winners, chosen via random.org, are Tara D (#75), Elizabeth B (#18), Brandi H (#94) and Amanda L (#63). We are in a similar situation in which our son attends school at one of the Special School District schools in our area and he has amazing therapists and teachers there. He has learned so much in his less than two years there. When the topic of inclusive education comes up, I often feel guilty that we aren't pushing for that, but our school district option for inclusion (which was very limited anyway) was not a good one. We could be trailblazers and fight to make it better, but I worry that would be at my son's expense. I am so glad this documentary was made and I look forward to relating to three families like mine. Good luck at your meeting, Ellen. I know you'll rock it. As for inclusion...you nailed it when you said, "For us, they include the quality of therapists and aides in our local schools (a couple of years ago, they fired the longtime aides and hired hourly-rate staffers of dubious quality)." Same struggles here. Well that and 30 kids in a classroom at the local public schools. And one special education teacher per 40 students with learning disabilities. Or 12 students on the caseload of one autistic support teacher who has to spend most of his/her day with the kids who best have their needs met in the self contained autistic support setting. But kudos to this film for bringing to light how important it is to support inclusion and even more so, how important it is to not shortchange our kids based on what you think you know. thinking about the budget cuts happening in schools everywhere and, as you note, already-overcrowded classrooms. If only an issue like this could be on the top of Obama's agenda. SERIOUS WISHFUL THINKING. Yes, it's definitely a film where you need to have tissues handy. At the same time, it's very much worth watching because it gives you perspective. Wow. Ellen, you have an uncanny ability to post things just when I need them most or when they fit perfectly into my day. I work in an inclusive preschool, and we have a child in our classroom who looks very much like Colin in the trailer (he even is working on using a head pointer to access communication devices!). We got the news today that he will be in a full inclusion classroom next year for kindergarten and it's so exciting! We were just so grateful that the woman from his school district (who came to observe him in the classroom) saw what we see everyday: that this is a boy who has things to say and really engages in the world around him, even though he has significant physical challenges. His road will never be easy, but he'll be starting off exactly where he belongs, and I really believe he'll be able to show them how much he knows, as long as they give him a chance. Thank you s much for sharing! I too cried at the trailer. I'm looking forward to seeing it Sunday! I so understand the frustration of these parents. I now homeschool, because I went to the schools saw what they were offering, asked for more, showed me our other option & it was glorified babysitting. My son would have sat in the corner biting his arms. Bored out of his gord. We are able to do so much with him at home. We can engage his attention & he does understand, despite what the teachers, therapists, and officials think. We weren't able to get them to understand his capabilities. frustration is an understatement.